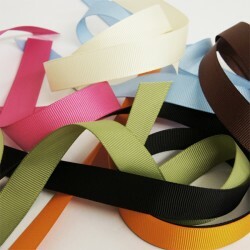 Grosgrain Ribbon almost feels like corded fabric. With stiff ribs which run across the ribbon. Typically, both edges of the ribbon are bordered, which keeps the grosgrain ribbon crisp. 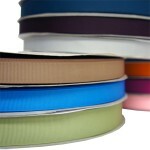 Grosgrain is also used to make larger width textiles, such as those use in gowns and jackets, as well as it's most common use as a packaging ribbon. Many garments are trimmed with grosgrain ribbon, which can provide a crisp edge and a nice contrast. Grosgrain ribbon is also used for ties or sashes on dresses, hats, and other garments, and it can be used to make large, stiff bows. In addition, grosgrain ribbon is used to suspend military medals and honors, as well as some civilian decorations. The ribbon comes in a number of widths. 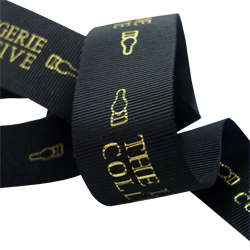 We can offer printed grosgrain ribbon, minimum 500 metres single colour. 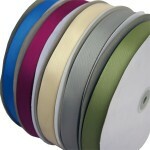 15mm Grosgrain Ribbon Metre Sold per metre 15mm stock colours only Polyester .. 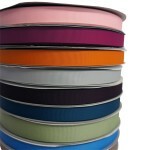 Printed Grosgrain Ribbon 23mm x 91m Price is per roll PRINTED WITH A BOLD S..